If you need to control the speed of a DC motor you have a few options. Controlling the speed by controlling either voltage or current is inefficient. Let’s understand a bit the speed control of DC motor Using Pulse Width Modulation because controlling how long the voltage is applied with a certain frequency gives you the best control over the motor’s speed. Conventional power supplies tend to generate lots of heat because are working as variable resistors pumping current through external circuits. The pulse width modulation circuits are digital circuits which produce pulsed current. Due to the fact that the pulsed width modulation power supplies works in a state in between on and off, the heat generated is very low compared to the conventional power supplies. The pulse width modulation can be used to power and control a lot of devices, from controlling LED’s to supply power for class D amplifiers. 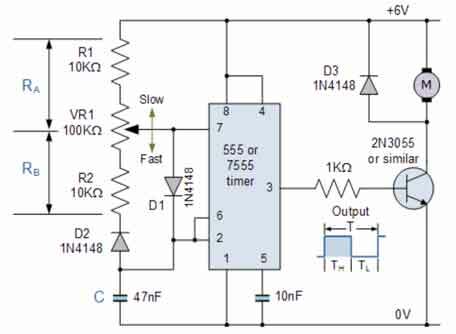 Speed control of DC motor Using Pulse Width Modulation is a common application of pulse width modulation (PWM). The pulse width modulation allows to control motor’s speed and also increase the energy efficiency of the system. The 555 timer Integrated Circuit is well known being used as timer, oscillator and /or pulse width modulator. To create the pulse width modulation the 555 IC is set to operate in astable mode with a few adjustments. The current is applied for a time T1=Ra*C where Ra is the resistor between the pins 7 and 8. Then, there is a off time T2=Rb*C where Rb is the resistance placed between pins 6 and 7. The frequency of the pulse width modulator is given by the formula Freq=1/(T1+T2). To protect the circuit from the inductive loading of the motor, a diode is placed parallel to it. This type of pulse width modulation circuit is very handy especially to control the motor at low speeds. If the resistance Rb placed between pins 6 and 7 is variable we can control the DC motor’s speed by decreasing or increasing the time the circuit will be in off state. If the load is big then the MOSFET should be placed on a heatsink. The 555 times Integrated Circuit is one of the best speed control of DC motor Using Pulse Width Modulation. If a more accurate frequency is needed then a micro-controller pulse width modulator can be used.